Travelling long distances can be extremely difficult with children, and unfortunately the troubles don’t end once you arrive at your holiday destination. Children and jet lag are a difficult combination, and helping your children adjust to a new time zone as effortlessly as possible should be top of your travel priorities. 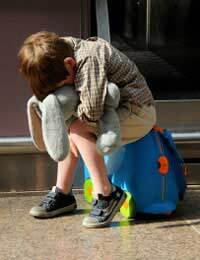 Children who get over jet lag quickly are happy children: those who find it difficult adjusting to a new time zone can often make the first few days of your long-awaited holiday miserable, and also find it hard to readjust once you get back home. Jet lag is the fancy term we use to define a disruption of the body’s sleep patterns, or circadian rhythms. General rules dictate that every time we cross one time zone, we can suffer a day’s disruption in sleep. That means that if you travel from London to Los Angeles, which is an eight-hour time difference, it may take you eight days to get acclimated to the new time zone. Nobody wants to spend over a week adjusting however, especially if you are only on holiday for ten days! And while adults may have special ways to help them adjust quicker, such as alcohol, sleeping pills and melatonin, children have no such things at their disposal. Keep the kids hydrated. Give your kids plenty of water throughout the flight to avoid illness, headaches and tummy upsets later, exacerbated by lack of sleep. YOU should stay away from the alcohol. Keep moving. Don’t let your kids be complete zombies on the plane. Instead, encourage them to move about as much as possible – good advice for you as well! Stick to the new time zone. Don’t let your children sleep the night away on the plane, if they are going to arrive only to discover it’s night-time – again. Keep them up if necessary, so they’ll sleep better when you arrive at your chosen destination. Setting new sleep schedules a few days before your trip can help. Eat healthily. Loading up on sugary food will give your children a quick high, then a deep low. In other words, it may eventually have the opposite effect you are hoping to achieve. Plenty of fresh fruit, veg, proteins and carbs is much better. Get them up at the “right” time. Don’t allow them to sleep in, even if they have had only a few hours’ sleep. You’ll be paying for it later, when they are wide awake and raring to go – at 4am. Put them to bed at the “right” time. And that means even if that means keeping them up, or putting them to bed “early”. Adhering to the new schedule will make all the difference. Keep them outside in the sun. If they’re sleepy and lethargic, take them for a walk outside in the bright sunlight. Don’t let them laze in front of the telly in a darkened hotel room. Keeping them out and about enjoying the bright rays of the sun will make the adjustment easier. Be strict. If your child is wide awake in the middle of the night after you arrive, be strict. If you allow them a full night’s entertainment – complete with television programmes, Nintendo games and yummy snacks – you can be sure they’ll wake the following night. Make things as boring as possible. Jet lag is never fun, and when it comes to children, it’s even less enjoyable. In fact, having a toddler or small child up in the middle of the night for several nights in a row is a sure-fire way to ruin the beginning of a holiday, so do all you can beforehand to minimise disruption.